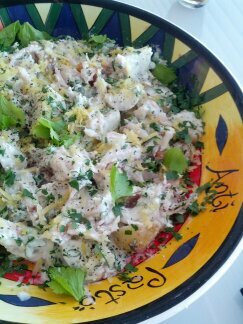 Horseradish and smoked fish were made to go together, and when combined with waxy potatoes they make a simple but divine salad. Dressing: whisk the sour cream in a bowl until smooth then whisk in all remaining ingredients & season. Remove the skin & bones from the smoked fish and pull fish into large chunks. Cook potatoes in salted boiling water until tender. Drain & set aside. When cool, peel and cut into large chunks. 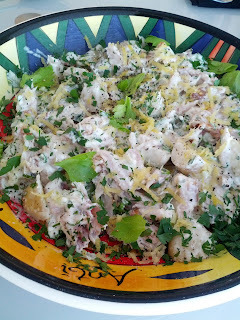 To assemble: combine the fish, potatoes & remaining ingredients in a large serving bowl & gently fold together. Grate some lemon zest over and a grind of pepper. Enjoy!